My cooking friend Arlene and her charming husband Herb stopped by The Culinary Cellar to drop off a box of books. They were actually the first people to see the sad, empty cellar after the flood but now I have their books to help make it alive again! All kinds of good books here for baking, canning, and a vegetarian cookbook from Arlene’s high school boyfriend! 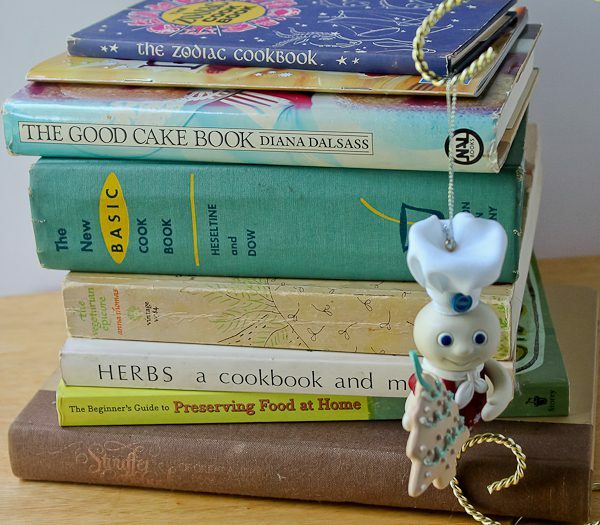 Then there’s the Zodiac cookbook and an extra surprise, a Pillsbury Doughboy Christmas ornament, which I love. 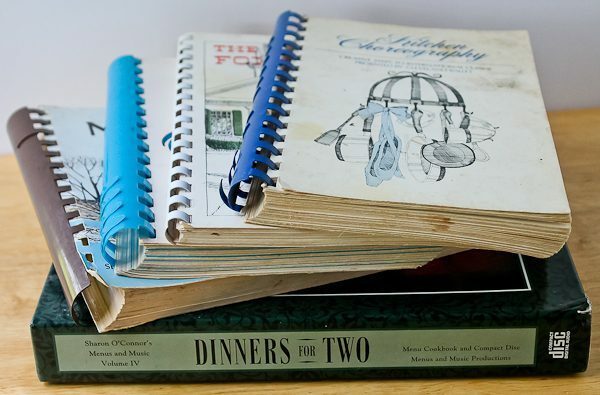 I love community cookbooks and here are some along with a special boxed “Dinners for Two” which includes recipes from romantic country inns and music from the San Francisco String Quartet. 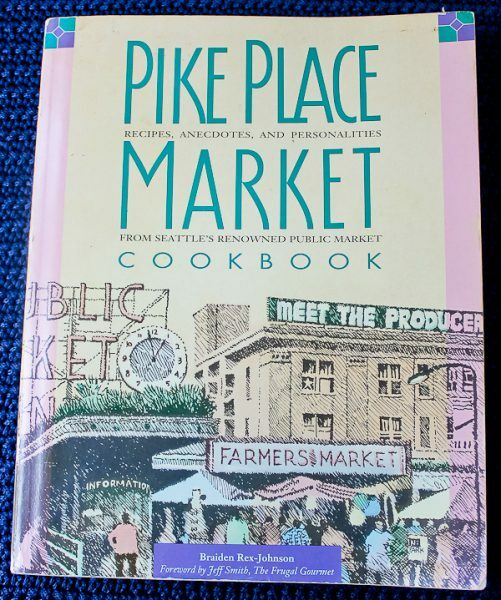 Here’s one I decided to cook from today because I love Pike Place Market in Seattle! I have only been to Seattle once but have wanted to go back ever since. Such a lovely city, my good friend Kim lives there, and I would head right to Pike Place again. What an incredible market it is. 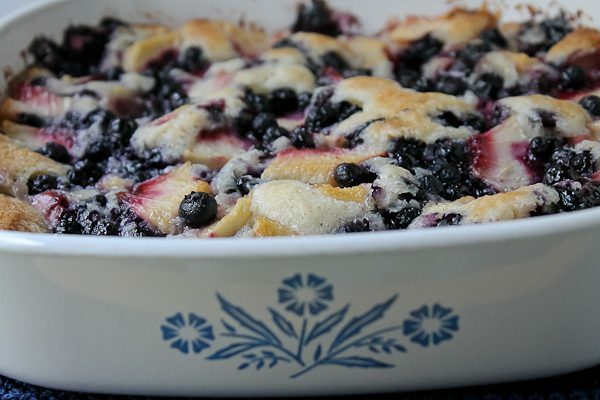 The recipe for Blueberry-Peach Cobbler sounded perfect for this time of year and it was probably the easiest cobbler I have made, not to mention delicious. While the oven is heating up, butter is placed in the pan to melt. Meanwhile, a simple batter is mixed and spooned right over the melted butter (don’t mix, just plop it on). Then the blueberries and peaches are mixed with some sugar and spooned over the batter, again, not mixing. Pop it in the oven and it’s done. I was so happy Arlene and Herb stopped by. They are very busy people! That day they happened to be on their way to a party then a play. Arlene keeps busy writing children’s books – she has written forty! She also has been a three-time Pillsbury Bake-Off finalist in addition to being a multiple winner in Taste of Home magazine contests including a grand prize for her cookies that were made from a spice cake mix, and most recently she won a Chicago Diabetes contest for her Shepherd’s Pie topped with Butternut Squash. I would call Arlene multi-talented indeed, not to mention generous and kind. Thank you, Arlene, for these wonderful books, and for letting me find this great cobbler recipe! Place butter in a 2-1/2 quart baking dish and place dish in oven. Preheat to 350 degrees F and let butter melt while oven is heating. Remove when butter is melted. Meanwhile, in a mixing bowl combine flour, the ¾ cup sugar, and baking powder. Add milk and stir just until blended. Spoon batter over melted butter in baking dish, but do not stir. Combine fruit and the ½ cup sugar. Spoon over batter, but do not stir. 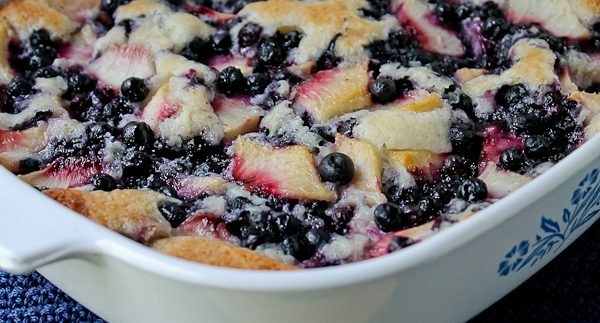 Bake until fruit is bubbly and crust is golden brown, about 45 to 55 minutes. Serve warm, with whipped cream or ice cream, if desired. Serves 6-8. Thanks for this beautiful article. I am glad you are enjoying them.Have fun! You are so welcome, Arlene! I love all your books. Thank you again, and hope you and Herb will come back soon and see the new rebuild. Arlene and I met through the 2014 Pillsbury BO and have become good friends. What an amazing selection of books she gifted you and how nice that she was able to deliver them personally. 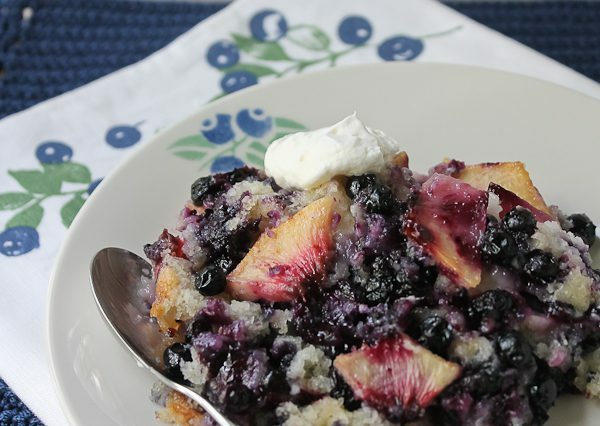 Thanks for sharing the Cobbler recipe! It was a joy to have Arlene and Herb personally deliver them, and they got to see the cellar as it is now. Next time they come, hopefully it will be all new and ready for an open house! So nice that Arlene brought you such lovely treasures! She is a sweet heart indeed!!!!!!! And very talented too!!!!! Yes, she is! Lovely books she brought for the rebuild! What a joy it would be if you could visit Seattle again. I would love it! We would have a terrific time together!! However, I understand you are very busy putting things back together. Such a blessing to receive so many cookbooks to rebuild. Just know that I am always ready to show you our lovely city and the outlying areas, with all its culinary delights. Thank you, Kim. I look forward to the day when we can return! Thank you for the kind words about Arlene. You are so welcome, Good Herb! Hope to see you both again sometime.